Adoor Gopolakrishnan is the best known Malayalm film director of International repute. He has won the prominent National Film Award of India sixteen times. The Smithsonian Institution in Washington, D.C. presented him at a retrospective as the “Poet Laureate of Indian Cinema,” and he has been decorated with the Légion d’honneur and the Commandeur de Ordre des Arts et des Lettres in France. Adoor played a major role in revolutionizing Malayalam cinema and is regarded today as one of the finest filmmakers of India. “Only a person who has undergone an excruciatingly painful and agonizing period in life can make a film of this merit”, said the great Indian director Mrinal Sen to Adoor Gopalakrishnan after watching the later’s magnum opus. “Elippathaym” . Adoor Gopalakrisnan’s Elippathayam catapulted him into International fame when it won the British Film Institute (BFI) award at London Film Festival for the most original and imaginative film in 1982. The decadence of feudalism that prevailed in Kerala, especially in the Nair Family, is portrayed in all its starkness in this mind-blowing film. “Marumakkathayam” was a system of matrilineal inheritance prevalent in the present Kerala State in India. Under the “Marumakkathayam” system of inheritance, descent and succession to the property was traced through females. The mother formed the stock of descent and kinship as well as the rights to the property was traced through females and not through males. Marumakkathayam literarily meant inheritance by sisters children as opposed to sons and daughters. In the matrilinear system, the family lived together in a Tharavadu(joint family home), which comprised a mother, her brothers and younger sisters, and her children. The oldest male member was known as the karanavar and was the head of the household and managed the family estate. Lineage was traced through the mother, and the children “belonged” to the mother's family. All family property was jointly owned. By the beginning of the 20th century, Marumakkattayam was increasingly seen as an undesirable remnant of a feudal past and laws came into being for formal property transfer to legal direct descendents. Adoor's Elippathayam takes place in this decadent feudalistic era when the law enforced division of common joint family property and ownership be passed on it to the rightful sons and daughters from the feudal lord. Remarkable for its focus on characterization and detail, Rat-Trap is set in rural Kerala. Its story concerns Unni, the last male-heir (Karanavar) of a rotting feudal joint family. He lives a lazy sedentary life with his three sisters, though the elder Janamma has moved out and lives separately when film begins. Unni is determined not to accept the fall of the feudalist system and rejects the world around him that is getting on with the times. His inability to accept the socio-economic changes of a new society results in his gradual withdrawal into a metaphorical rat-trap sprung from his own isolation and paranoia. As Elippathaym unfolds, Unni is wallowing in his comfy life as a feudal Lord. He knows that the social wind is slowly turning against him when the elder sister Janamma and her son approach him for proportional division of property. He doesn't allow it; instead he asks them to stay with him. He is also concerned about the marriage of his submissive younger sister Rajamma who has crossed her marriageable age. Rajamma slaves for her brother from morning to night, performing every chore he asks her to. We learn in the course of the film that Unni has refused to marry her off – ostensibly because the prospective groom is a widower, but in reality, because without her, his everyday existence will be threatened. Unni also knows that her marriage may entail some property division as well. Unni is neither interested in sharing his property nor in sharing the emotional issues of the inmates - may it be joy, sorrow, excitement or illness. Having chosen to alienate himself from the society, his is a life of stupor and indifference. The youngest sister Sreedevi has failed in her examinations and is studying in a tutorial college. She lives in a fantasy world of romantic daydreams and is the only person who has some contact with the outer world. Sreedevi’s rebellion comes in the form of flight from home; she leaves abruptly and we suddenly hear she is gone – without build-up, or indeed a thorough attempt to recover her. When Rajamma pleads him to enquire about Sreedevi, he turns a deaf ear. This devastates Rajamma, who is already a sick person with stomach ailments. She seems overwhelmed by unendurable grief and soon falls violently ill. The villagers come into her room and carry her away – we don’t know where. 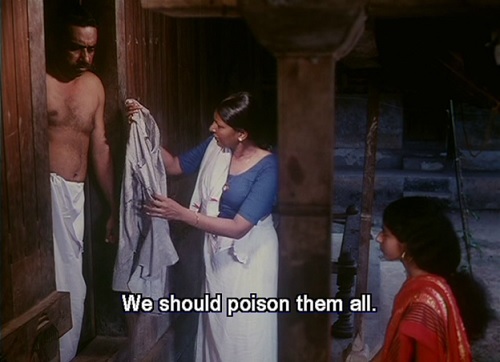 The screeching sound that one hears whenever Sreedevi takes the rat-trap to the pond for killing the trapped rat is also heard when Rajamma, the rueful rat in the house, is taken away by villagers in a stretcher. With her ‘passing,’ the feudal regime Unni has been inserted in slowly unravels. He slips into a neurotic fear psychosis. He shuts himself from the world into a room; darkness overpowers him, and he becomes more akin to the rodents he spent his life despising: an intrusion, a bother. Adoor Gopalakrishnan says in his interview that the movie was inspired by the feudal characteristics of his own family. The Rat Trap acts as a metaphor to understand how the women are placed within the feudal system of Kerala. 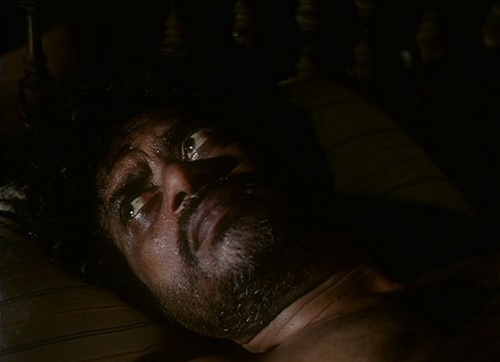 Early in the film, the central character Unni wakes up one night screaming as if he was bitten by a rat. Though the inspection by his sisters couldn’t find any rats, they buy a rat-trap as a protective measure. That night a rat gets trapped in it which Sreedevi takes into the neighboring pond to immerse and kill. The sound we hear when the door of the rat trap is opened is similar to the sound we hear when the doors of the house are opened. Slowly, we realize that the whole house itself is a rat-trap, and the only comfortable rat is Unni. Rajamma is disillusioned by her brother, but she lacks the courage to nibble and break the iron railings around her. The middle-aged Unni is a complex creature. He derides the uncomfortable changes around him and unconcernedly wallows himself in his sedate life. He is non-reactive to not only to political changes but even to physical temptations. He is not interested in sexual overtures and when a female worker in a cashew nut plantation tempts him, he recoils in terror. He is weedy and emasculated in confronting even silly setbacks and simple perturbations happening around him. For example, when he gets ready and goes out for a marriage, he notices a puddle on his path due to rain and seeing this small obstruction, he returns home without attending the marriage. When a cow comes to the front of his compound and grazes the plants, he doesn’t rises up from the chair; instead, he anxiously calls Rajamma to chase it off while returning to his reading of newspaper. On another occasion, when thieves come at night to steal coconuts from his premise, he is hesitant to get out of his bed to confront them. Unni comes out as selfishly obsessed about himself. He is constantly engaged in leisure; he reads the newspaper; he cuts his nails, trims his moustache; he sleeps. His ritualistic oil baths are fascinating and he waits for his sister Rajamma to heat the water to exactly the right degree, so he can bathe. On the other hand, we have the women, all of whom are caught within this suffocating system – including the one sister who is married and lives elsewhere. She comes back to claim her share of the property, and is refused. The youngest sister, Sreedevi is the most rebellious and eventually runs away. Thespian late Karaman Janardhanan Nair has acted the role of Unni with enormous sensitivity and precision. His dull movements and bovine facial expressions sanctify him as a stationary superstar of cinema. No one could have acted the role of pallid and pitiful Rajamma than Sharada, the great Malayalam film heroine of yesteryears. Jalaja as Sreedevi is indeed a spirited girl befitting that role. Adoor’s philosophy of minimalism is evident in the bare conversations and resounding silences. 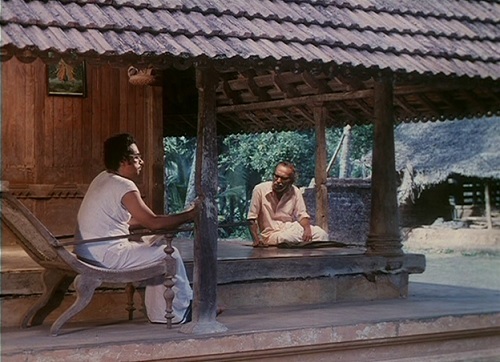 Silence is a major motif throughout the film: the characters walk and work in silence; conversations are left hanging in mid-air, supposed dialogues become monologues when Unni doesn’t respond. Scenes without sound speak more eloquently during many dramatic moments in the film. Color and music are strikingly significant constituents of the film’s thematic development. Adoor has used color with symbolic and communicative import. For example, Rajamma, the most submissive character in the film, wears blue portraying her generosity and also her genuine and gentle nature. The elder Janamma wears the earthy liberating color of green, and she is practical. The rebellious, vivacious and passionate Sreedevi wears red, and she is the only one who truly desires a revolution and flight from the suffocating ambience. Unni wears a white dress, a union of all the previous colors, indicating his spineless and vaporous persona and his ghostly gait. The vertical stripes in his white dress possibly suggest his indecisive and fidgety nature. The music is throbbing, incomplete throughout the movie to show the sense of sustained urgency. It effectively alienates our involvement and helps us to concentrate on the visuals. The spatial presence of the characters has also certain import. Most of the time, we see Unni at the foyer of the house as if to assert his false feudal identity as the head. Rajamma spends most of the time in work spaces, which speaks of her slavish mentality. Sreedevi spends most of her time in bed rooms or in front of the mirror. Her romantic thoughts and colorful dreams of future liven up in these places. Similarly, though the camera is static when it deals with emotional problems of Rajamma, it is quite lively when it comes to the dreamy world of Sreedevi. The camera itself is like a rat-trap spending most of the time indoors than outdoors. Elippathayam also uses a sensorial metaphor to evoke the outside to the feudal. When Matthew comes back (presumably from the Gulf) wearing dark glasses, he says he came by a flight his company paid for. He hands Sreedevi a perfume she receives happily. We see her later in the film applying it in copious quantities. Soon after the meeting with Matthew, the sisters are out in the fields and Sreedevi sees a plane flying, which is not only invisible to Rajamma, but also makes her ‘blind’ for a few moments. This is one of two occasions when a plane eludes her sight. Clearly, the narrative seems to be using the notion of visuality and sensuality (through the perfume) to invoke a world beyond the feudal – a world of commodity and speed, where the senses are in full play, where the boring normality of the quotidian in the estate will be lost forever. That Sreedevi is the one who receives the perfume and sees the planes is also indicative of her desire to flee this life of repression. The film's open ended ending is remarkable. Unni’s being thrown into the water serves as “a strong jolt,” but does not spell his death. Adoor remarked in an interview that to kill Unni would have meant denying him the opportunity to learn from experience. The sight of Unni emerging out from the pond with folded hands seeking an apology could be taken as a final admission of his vanity and infirmity. Elippathayam is highly impressive from many angles: precision in its filming and editing, depth in its social and philosophical ideas, robustness in its script, thoroughness and concentration to details such as lighting, sound and silences. The cumulative effect is a film of extraordinary insight and power. In a way, the central character possesses universal qualities. There are many such individuals in every society. They intentionally stay away from all societal affiliations, shun taking active part in community issues fearing botheration, lack courage and opt to cringe and crouch from everything around them, declare themselves as introverts harboring cynicism, remain as indecisive weaklings fleeing from action. This movie is an elegiac portrayal of the predicament such people. One cannot remain unaffected by its underlying pathos. In every sense, Elippathayam ranks as one of the crowning achievements of Indian cinema of 20th century and perhaps the best Indian film produced after Satyajit Ray’s “Pather Panchali”.